HD Glasses: Because The Real World Isn't Clear Enough | OhGizmo! 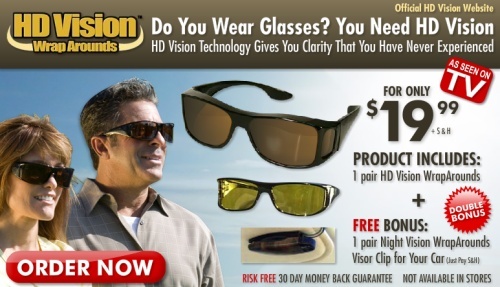 What you’re looking at right there my friends… are High Definition Glasses. Wraparounds, no less. Because you see, no one may have told you this yet but that pair of eyeballs stuck in your head, well… it ain’t good enough. It’s 90’s technology, man. And you don’t want to be stuck in the 90’s now, do you? You heard us: all this time you’ve been seeing the world in Low Def. These glasses right there will take care of that problem for you. HD Vision technology gives you clarity that you have never experienced. Just like High Definition TV. It used to be that sticking a lowercase “i” in front of a name was enough to move a product. Seems “HD” is the new “i”… But who can resist that “Modern European Style”? At $20 a pop, they basically sell themselves. Hit the jump for links, as well as a snazzy video of a similar product (not a wraparound, so not quite as cool… but damn if that’s not an awesome infomercial). Is that legal? Can you advertise a product that’s a total lie? Leela: Fry, you’re wasting your life sitting in front of that TV. You need to get out and see the world. Fry: But this is HDTV. It’s got better resolution than the real world. blublockers are awesome. the viper style are perfect for motorcycle riding. seriously. sometimes they have them 2 for 1 at wal-greens. if only they’d stock the polarized one too.